Your delicious dessert quick fix for last minute guests! Contrary to a proper tiramsu which would take a few hours, you can whip up this one in less than 10 minutes, right before you serve dinner. Let it sit in the fridge for 15 minutes to soften the cookies. 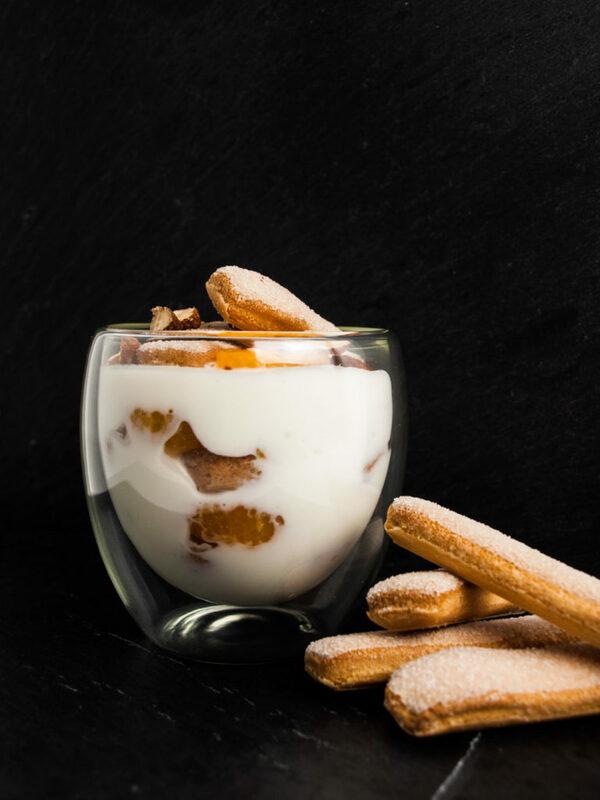 Tiramisu is usually made with ‘Lady fingers’ also known as ‘sponge fingers’. These are dry long biscuits topped with sugars. As they are dry and crunchy they soak up liquid very well. This makes them ideal for a quick tiramisu that’s literally done in minutes. Again, I’m using ‘Quark’ in this recipe, as it’s widely available here. Rich and creamy, low fat and slightly tangy. So good for desserts! In other countries it’s often known as soft curd or cottage cheese. If you can’t find it, use farmer cheese or cottage cheese (wiki on alternatives). Make this even richer with proper mascarpone or ricotta cheese. You can also easily prepare this a few hours in advance and store in the fridge until needed. Whip this little treat up in no time and surprise your guests! Drain the tangerines but save about 5 tablespoons of the “juice” (well, syrup) in a glass. In a bowl using a whisk, mix together the quark, vanilla sugar, lemon juice and the tangerine “juice” until smooth. Take two glasses and place a layer of the sweetened quark inside. Place a layer of cookies on-top (break into pieces to make them fit), followed by a layer of tangerine pieces and then quark again. Repeat with these layers and finish with quark. Decorate with almond slivers and some of the tangerine pieces. Fetch your cooled tiramisu out of the fridge and dig in! Happy faces! Let me know in the comments what you think of the recipe! Don’t like tangerines? What other fruit do you think would go well with this dessert? Leave your comment and help to make this even better! Previous Post Being vegetarian for a month is challenging but fun!